Cals Refineries is one stock in my small cap stock list and making rounds nowadays in circle of people who buy penny stocks. It was first suggested to me by Mr. Sreenivas. Sreenivas is from Bank of Oman and is an avid growth stock investor for long term investment horizon. He even called me up to discuss the same passionately. :) There were few others after this who asked me about Cals Refineries so I decided to research a bit about this and here is the stock research report with my opinion. 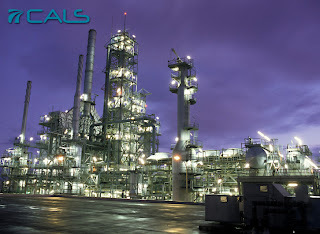 Cals Refineries Limited was incorporated on the 25th of July, 1984 as a private limited company. On 22nd September, 1992 the company was converted into a public limited company and is now listed on the Bombay Stock Exchange (BSE) under the Scrip Code 526652. With the energy sector playing a pivotal role in global economies, the company aims to actively participate in it's growth in India as well as in international markets. Cals Refineries Limited, in the first phase of a mega project, is establishing a 4.8 MMTPA (100,000 BPD) refinery at Haldia, India. Chairman of Cals Refineries, Mr. M.S. Ramachandran, was Chairman of Indian Oil Corporation (I.O.C. ), India’s largest Oil & Gas company. Mr. M. S. Ramachandran has over 38 years of experience in the Oil and Gas industry. He was Chairman of Indian Oil Corporation (I.O.C. ), India’s largest Oil & Gas company. He helped the government to implement various policies that would attract private players into the Oil & Gas sector. At I.O.C., he redirected the organization around key business lines with greater commercial focus and market facing capabilities. During his tenure, Mr. Ramachandran increased sales growth from USD 25 Billion to USD 34 Billion, which increased the net profit of company from USD 0.65 Billion to USD 1.2 Billion, raising the company’s Fortune ranking from 223 to 189. Cals Refineries Ltd has signed a deal with oil major BP for up to 5 million tonnes of crude a year for a refinery. So the supply of crude is already guarenteed. Spice Energy, the parent company of CALS has another subsidiary, Spice Exploration, which has operations in Africa and Indonesia from where crude could be made available. Cals Refineries has signed a deal with oil major BP to buy up to 100,000 bpd crude for its refinery. As per the deal, 60,000 bpd is confirmed, the balance of 40,000 is optional. Additionally, Cals Refineries Ltd has signed a memorandum of understanding (MoU) with Bharat Petroleum Corporation (BPCL) for petro products off-take from CALS. The MoU has been signed in order to off-take the part of petroleum products by BPCL from CALS in its first phase which is a 100,000 BPSD crude oil refinery after accounting for the products committed to British Petroleum (BP) and the entire petro products from CALS in the second phase of expansion which is another 100,000 BPSD refinery at Haldia, West Bengal. Gross Refining Margin (GRM) Per Barrel is 10$ = 500Rs Approx. Share Price = 15 *2.3 = 34.50 Rs. So if everything goes as per calculation in phase 1 and company manages to produce as estimated, around Rs. 30 - 40 could be the stock price range. They have plans of capacity expansion for second and third phase as well. I am not sure about the numbers. CMP of the stock: 0.68 Rs. So you decide how much money you can loose comfortably by investing in penny stock and invest that amount in CALS Refineries. ! @##@$%^%&^%$#@ this must have been your immediate reaction after reading this statement but this is what my true opinion is! Cals refineries promoters hold only 0.11 percent share in this company and Shares held by Custodians and against which Depository Receipts have been issued 83.98 percent (custodian name is The Bank of Newyork Mellon DR) so public share holding is 99.89 percent and there are a huge equity capital of cals refineries. Total 7,931,300,000 shares of Cals refineries held by general public. As I have read in Business Standard news article, promoters do hold a big chunk of equity (almost >70%) which is held by custodians for issue of depository receipts at the moment. This might be a positive note to make on promoter's holdings. I am not recommending you to buy stocks to invest in CALS refineries but I am asking you to take a bet in this counter. If it goes well, you would gain a lot, if you loose, never mind. MERCATOR LINES - 0.40 paise to 184 Rs. Latest: Cals Refineries - Small Cap Penny Stock - What to do? The company looks very bad. It has a very negative net current asset. Its operating history is also bad. The company right now looks very horrible. Also please dont think that all penny stocks will turn out to become multibaggers. The company has around 800Cr. outstanding shares. Most of the companies I have seen so far have around 10Cr. on average. As you said, promoters holding is a concern. Not even they are ready to support the company. How can it ever become a multibagger? Today, I got a mail from Cals managemnet to my query. They said they are in talks with certain banks and investors. And they are confident of doing Financial closure quiet early. What is the future of this share? Should I hold and if yes then for how much time..
the blog posting is really good & informative. Excellent blog.I read & enjoyed. i have 1 lach shares @.85. whether hold or sell present now situation? in future how much raise? how much time taken? ples tell me sir? Mallesh. I tried to buy it through my icici direct.com. I like your post very much.keep it up..i will also refer my friends to go through your blog. Thanks for sharing. Oopper bataye gaye stock ka low, Indian economy aur stock market ke sabse kharab time ka hay.That time Stock market ka tournover low ho gaya tha, FII Inflow bahut kam tha. Lekin CALS ke mamla pura ulta hai. 4)Stock market tournover high,FII Inflow robost,Sensex high ke pas hay,Indian economy world main sabse behtar hay.Phir kyun CALS refinery apne all time low pe hay.Kyon promotar is multibagger company me apni holdig nahi bada raha hay. Cals is seeling few crore shares to spice refinery.Can any one say the implications of this and why are they doing it?Is this a paper based compnay and Hawala?any comments? Good news. I read & appreciated. Share price of Cals depends on project completion date of the Refinary.What is the expected project completion date for this project? After my study on Cals Refinery...the Kharafi Group, Kuwait is going to be invested 150 milliion Dollar in Cals Refinery project..which is the boost up for the projects of the group...and for commissioning and implementation of everything till start the company we have to hold the shares and trust on company, in my view the fair result will be get after two and half years (i.e., in 2012-13). As I am also working in the Refinery company, my suggestion is that rather than worry about this stock all of you must have to relax because you will get the good result down the line of 2-3 years. but what about the promoter shareholding pattern? and they are planning for this Haldia project, do u think it is practically feasible for the company to make such a good profit ? PLEASE ADVISE FOR INVESTING IN THIS STOCK I CAN HOLD FOR 5 YEARS. PLEASE TELL ME TARGET PRICE AFTER FIVE YEARS. SIR PLEASE GUIDE ME I AM HOLDING 4K SHARES OF CALS REFINERIES@.34,WHAT IS A REALISTIC TARGET MY HOLDING PERIOD IS FOR A YEAR.